Much of the discussion about Peake's Titus Books has been about how to place them in the lexicon of English literature. I am proposing that these books should be read as works of postmodern existentialism. Both postmodern theory and existential theory are interested in the same issues, such as the loss of grand narratives, the rejection of totalizing world views, the subjectivity of truth, the nature of one's existence, and the search for meaning in an increasingly incomprehensible world. Societal issues, such as political upheaval, the growth of major cities, war, and advances in science and technology have led both postmodern and existentialist thinkers to view the world as chaotic and intrinsically unknowable and man's place within that world as increasingly unstable. All of these concerns are addressed in Peake's texts. Peake's novels reflect the existential struggle of its hero, Titus Groan, to break free of the Hegelian world view represented by Gormenghast and its traditions, and into a world in which he is free to be an individual and to find his own truth. Peake uses images of solitude and extreme isolation to represent the essential human condition as conceived by existentialist philosophers like Kierkegaard and Nietzsche. It is when they are alone that his characters are truly free to be themselves, without the social constraints imposed by the history and traditions of the castle. Titus's rebellion against Gormenghast represents the rejection of totalizing world views, a rejection found at the heart of postmodernism and existentialism. Incredulity toward mass society and culture are also central issues in postmodernism and existentialism. Nietzsche, who is claimed by both existentialists and postmodernists as a forerunner of their respective philosophies, claimed that God is dead, a belief reflected in the distinct absence of God from the Titus books; instead God is replaced by the ritual of Gormenghast. In Titus Alone He is replaced by technology. This also demonstrates the distrust felt by existentialists and postmodernists alike of a mass society in which the individual is consumed and becomes simply a part of the faceless crowd. Peake expresses a deep suspicion of technology and scientific advancement, a distinctly postmodern suspicion, that was not uncommon among writers after the second World War. 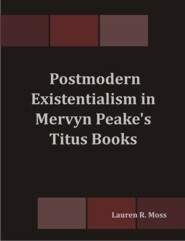 By examining closely the concepts and themes associated with both postmodern and existential theory, it is clear that Peake's Titus Books are deeply concerned with both philosophies. Though Peake does not successfully answer the philosophical questions his novels pose, it is significant that his work attempts to do so.